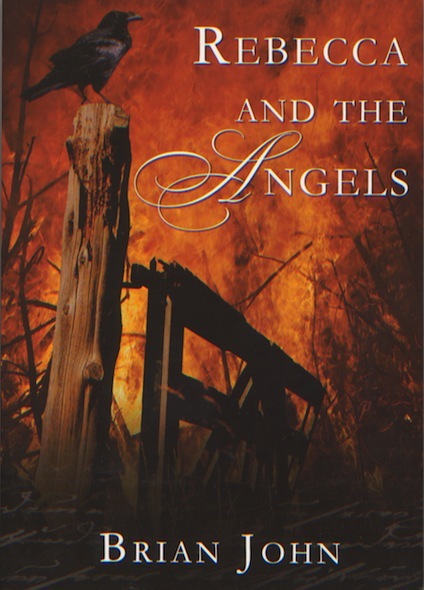 Rebecca and the Angels by Brian John, Greencroft Books 2004. ISBN 0905559 83 5. Published 1st November 2004. Reprinted 2006, 2010. Total copies sold: 7,000. This is a vivid and tempestuous tale set in the early nineteenth century, at a time a great social unrest. Martha Morgan, the Mistress of Plas Ingli, has a premonition of grave danger to come. As the effects of poverty and starvation afflict the neighbourhood Martha tries to influence the corrupt Turnpike Trusts, who are compounding the miseries of the poor by building new and illegal toll gates and rigorously collecting tolls. In 1839 the destruction of the tollgate at Efailwen triggers off a phase of rioting which spreads across West Wales. 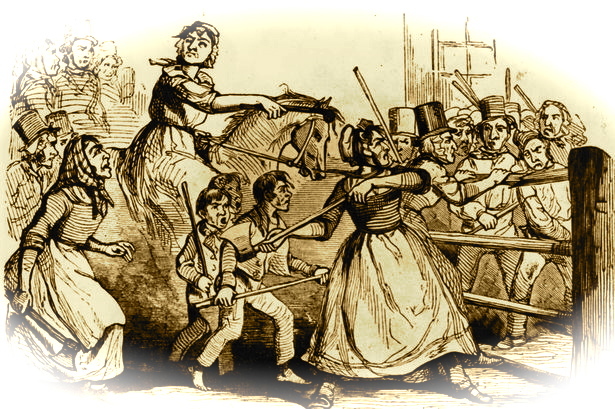 The riots are always led by somebody called Rebecca, and the rioters are always referred to as her daughters. For a time there is guerrilla warfare with the police and the army out-manoevred by men who know every inch of the countryside. Martha is never far from the action, and as the riots spread she and her family and servants are sucked into a murky world of intrigue and betrayal. With considerable heroism on the part of her nearest and dearest, and with not a little luck, Martha manages to keep out of trouble. This is probably the favourite book with the male readers of the Saga. That is because it can loosely be described as an "Action Thriller" as well as belonging to the rest of the Saga as a true historical novel. Question: Why did you decide on a diary format for the books? Answer: When the story came to me it was all about the diary of a long-lost woman -- its discovery and its contents. The bulk of the story had to be told through diary entries if I was to be true to the “gift” given to me in that strange delirious episode. That made me very apprehensive, since I know that very few successful novels have been written as diaries. But having started to write On Angel Mountain I discovered that there were many advantages to the diary format; for example, some entries can be short and others long, and if the “diarist” has nothing exciting to report, there can be gaps of months or even years. People seem to like relatively short entries with frequent breaks; it makes the phyisical process of reading easier. What is more, there is a great immediacy about diary entries. Things can happen very suddenly without prior warning. And diary entries can easily reflect changes in the heroine’s mood or in her opinions from one day to the next. Human beings are like that, especially if they are as impulsive and wilful as Mistress Martha! One has to resist the temptation to analyse motives and to prepare the ground for forthcoming events, and there is no room for lengthy sermonizing or moralizing. That’s fine by me, since some books (for example Hardy’s Tess) have too muuch of the author and too little of the heroine in them. The biggest problem with a diary is that Martha cannot, anywhere in its pages, describe herself -- readers have to get to know her through her reporting of what other people say about her, or simply through the way in which she describes conversations and events.